Hungry, horny, sleepy, curious. : How do Vipassana centres in India differ? How do Vipassana centres in India differ? A friend of mine recently asked for some advice on which Vipassana centre I would recommend for his first course, if he tries it during a visit to India. My explanations ended up being rather verbose, so I figured it wouldn't hurt to publicize them. If you are considering taking a Vipassana course in India, I hope this information is helpful to you! Bangalore (Dhamma Paphulla): I did a 3-day course here, and it was okay. The 3-day course is available to anyone who has taken the 10-day introductory course. It was much less intense but I found it really valuable since my first 10-day kind of freaked me out. :P They don't have a pagoda (no meditation cells so you're always in the main hall). At the time they didn't have individual residences so you couldn't meditate there, either. They have a few now. It's directly adjacent to a village so there is sometimes more noise than one would like. There aren't a lot of trees and there aren't really any animals (cute animals provide welcome distraction on the hardest days). The paths are dirt... and sometimes mud. With all of that said, I think I find the teacher at the Bangalore centre (he lives nearby) to be one of the more approachable. The fellow who donated the farmland to create the centre is also a wonderful human being; he helped repair a flat on my mountain bike after the 3-day course then invited me to his house for tea. The centre is, of course, pretty convenient. It's about a Rs.500 Uber ride to get there and if you can't get an Uber/Ola on the way back, there's always rickshaws and buses. The metro almost reaches the village but isn't operational at the major junction points yet. 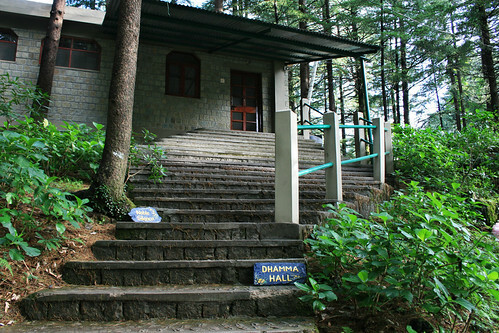 Dharamkot/Dharamshala (Dhamma Sikhara): I did my first 10-day course here. Dharamkot is a little village above McLeod Ganj, which is above Dharamshala. The space is wonderful. Weirdly, the centre is built right in the middle of a pine forest the British planted, so the whole place smells like the Canadian Rockies. The village doesn't add much noise -- the monkeys running across the tin roofs are the only intrusive sound. The centre is small and can't grow (despite receiving quite a lot of money in donations, I imagine, due to all the foreign tourists who take courses here) because there is a Tibetan meditation centre to the west and the village to the east. Hence, it has no pagoda and never will, but it does have individual residences for most meditators (shared bathrooms / showers, though) that you can meditate in when the teacher gives you the option. It was nice and cold, which meant no sweaty meditations and no mosquitoes. There are stone paths everywhere. Most of the course was attended by foreigners, which I'm guessing is generally the case because of the centre's proximity to the touristy land of McLeod Ganj. The teacher was some professor (or something) from Delhi. Sometimes he was really helpful and sometimes he felt almost dismissive but I don't think I would have made it through the course without my daily conversations with him. Jaipur (Dhamma Thali): I did my second 10-day here over last Christmas / New Years. This space is beautiful, if somewhat plain (it's in the desert, after all). There were langurs and peacocks and huge flocks of smaller birds. It was cool but not uncomfortably cold, which meant I avoided mosquitoes for one more year. ;) The centre is older and has stone footpaths between the residences, pagoda, and meditation hall(s) -- avoiding dust and mud made a surprising difference in my overall comfort, as I found out this year. It's a huge centre, which means the experience is more intense and the course grounds are busier. There wasn't much space to walk without seeing other dudes (or at least their feet, which meant adjusting my walking path mid-stream... this is surprisingly disrupting). The meditation hall is almost entirely underground, so it's quiet, huge, cold, and dark. That made the meditation more intense but also made the whole experience a lot creepier. The pagoda has very little light entering it so the meditations in the cells were even *more* intense. The courses in Jaipur are primarily conducted in Hindi -- there were only a handful of foreigners and the teacher was much more comfortable in Hindi than English, so I'm very glad this wasn't my first course. Despite its size, the Jaipur centre is kind of run down. The meditation hall, pagoda, mini-halls, and cafeteria are well taken care of but the residences leave something to be desired. However, most of the residences here are individual: you might have your own toilet and shower. Because this is a larger centre, some of the volunteers are Very Serious Meditators(TM), which means they can come off as kind of culty or creepy. FWIW, none of the 5 teachers I've met have given me this vibe. Nagarjuna Sagar Dam (Dhamma Nagajjuna): I did my third 10-day course here this year and I would say this was my least-favourite centre. The government has allotted some 250 acres to Buddhist ...stuff... and the centre is on a 35 acre portion of this land. It's huge and kind of barren. The paths are dirt, which means you'll spend a lot of time knocking dust and sand out of your feet before entering the pagoda and meditation hall. The meditation hall is quite small and they fill it to capacity. So for tall people like you and I the knees-near-neighbours situation is rather uncomfortable. There is a pagoda, which is good. New students are allotted cells on the 6th day, I believe. However, the pagoda isn't shaded and the meditation cells can be surprisingly bright inside which sometimes makes meditation difficult. I was under regular assault from mosquitoes. Given a meditation technique that's all about "remaining equanimous with whatever bodily sensation is happening in the present moment", I don't think my beginner-grade equanimity is ready for 2 full meditation periods (dawn and dusk) of constant mosquito bites just yet. The meditation instructions on the 10-day course are already quite verbose and in Telangana (Andhra Pradesh) the instructions come in English, Hindi, and Telugu. The meditation centre is far removed from any city or village so it's extremely quiet save for some distant highway noise. It's right beside Nagarjuna Sagar, and there was apparently a beautiful spot where everyone would go to watch the sunset over the lake. I met a fellow on the 10th day who exclaimed, "I saw you weren't coming to see the sunsets! I wanted to tell you so badly to come and watch them... but I couldn't talk!" Quite cute. It's possible a better view of the lake might have made the course experience a bit more enjoyable so I might be underselling the centre in this blurb. The buildings are very pretty and the architecture has a lot more character than other centres -- you can see some photos on their website. Oddly, the cafeteria has allotted seating and utensils. Most of the cafeteria seating is on the ground... just in case 10 hours a day of cross-legged sitting wasn't enough. Despite having both a meditation hall(s) and a pagoda, the centre can only host about 40 men and 40 women. There was a lot of construction under way, though. The teacher seemed very approachable and though I didn't speak to him much, a Dutch girl we met after the course said he was very helpful. She spoke to the male teacher because this course had no female teacher, for some reason. Prior to this, I wasn't even aware that was allowed. After the course, we stayed in a nearly-empty hotel near the Dam... but the entire area feels like some sort of abandoned moon colony and I don't recommend sticking around for long. Most of the students on the course came from Hyderabad, which is a 2 or 3 hour drive. My one biggest issue with the centre was the administration's insistence on the "sacred" nature of the cushions. Leaving aside the introduction of religious or near-religious concepts into an otherwise largely secular practice, one of the administrators actually ruffled my cushion and told me to take my feet off of it because he didn't like the position I was sitting in. This sounds trivial, but this happened on the fourth day after a particularly painful and difficult meditation so the attention was particularly unwelcome. Between the sunlit meditation cells, the mosquitoes, and being spoken to by a staff member, this was the least intense 10-day course of the 3 I've attended. It felt like I was constantly distracted by something. I'm not sure if that helps you pick or not. :) The most interesting / intense / terrifying / valuable course I've taken so far was definitely in Jaipur, but it's hard to say how much of that was due to the environment and how much was due to my mental state. If I had my first course to do all over again, I would probably still do it in Himachal Pradesh. The Himachal centre is closed from December to March (it gets quite cold) so that won't be an option this Feburary. No matter which centre you pick, you should pick and apply sooner than later. Sometimes it takes them a couple weeks to respond to an application, which can make travel planning difficult. Hi I did my first vipassana course in bangalore recently. Planning to do next time in hyderabad as one get's single stuppa how's it different from bangalore does everyone get single stuppa to meditate also does every one get single room with bathroom...?